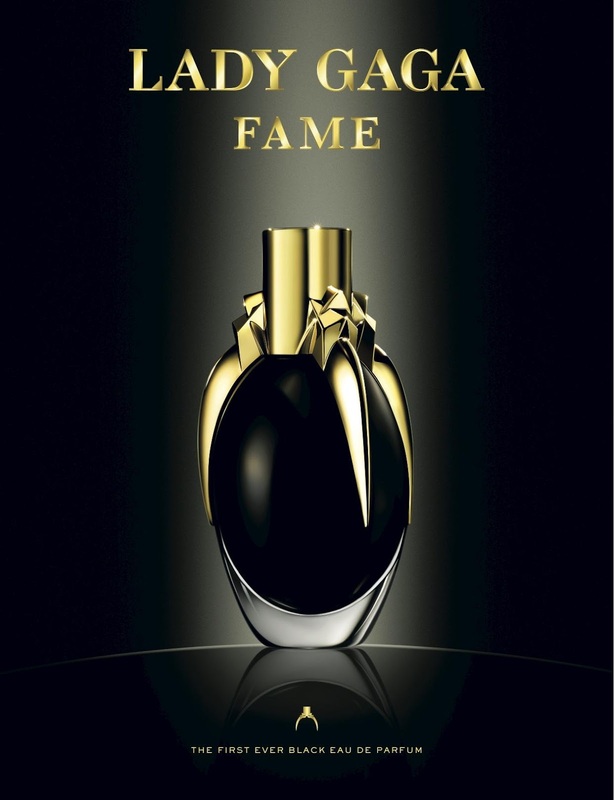 From the day I read that Fame would be a black perfume that sprays clear and becomes invisible once airborne, I was very fascinated by the concept. It is the first perfume ever to utilize such a technology. The packaging lists the perfume's notes as "tears of belladonna, crushed heart of tiger orchidea with a black veil of incense, pulverized apricot and the combinative essences of saffron and honey drops". Instead of the pyramidal structure used in most perfumes, Lady Gaga Fame uses a "push-pull technology", where the ingredients demonstrate aspects of each note without precedence. Rather than utilizing top, middle, and base notes, the perfume is based on three accords – "dark" (containing the Belladonna notes), "sensual" (containing the honey, saffron, and apricot notes), and "light" (containing the Tiger Orchid notes) which come together to produce a floral, fruity scent. The perfume references the allure of fame and fortune with its sweet scent and gold crown, while the inclusion of the poisonous belladonna, along with the black liquid, represent the dark or destructive side of fame. The packaging says the perfume is "black, like the soul of fame". Great metaphor. Well designed and put together I must say. I'm noctural so the 6-8am slot is pretty much my bed time (its 7am right now and I haven't slept yet) and at a time like this about a month ago, I came across a blog post reviewing Fame. After reading lots of good reviews, I was intrigued by the perfume's description. Of course, I read up about it in detail on Fragrantica to see if I would like it, as the site shows you suggestions of perfumes similar to the one you're checking out. When I checked out an online store in India, I was delighted to find the perfume at a highly discounted price. I had never bought perfumes online and was very skeptical about whether it would be fake, but thankfully a few days later, as the package arrived and I opened it, I was relieved to see that it was a genuine product. Housed in an egg shaped glass bottle with a gold claw lid, this inky black perfume looks really gothic, totally like something Nancy from The Craft would wear. Did I ever mentioned that I love goth fashion and of course, that movie? Surprisingly, the black liquid doesn't stain your clothes. Getting to the main part now, the fragrance. Unlike most reviews I read, I don't really find it sweet. There's nothing overpowering about it that makes it unwearable or overwhelming. To me, it's more like a slightly spicy floral blend with a lot of incense. There’s a richness to it that makes it a great night time fragrance. The sad part? It doesn't work with my body chemistry and doesn't last for very long on my skin. However, do I regret the purchase? Not at all, I got a great deal, a cool looking perfume and though it may not last on skin very long, its great on clothes and hair! Have you smelled this perfume? Have you used any other celebrity fragrances? Let me know in your comments below. I didn't know that about the perfume! That is actually really interesting that it is black but would spray clear. Cool! My sister has this and absolutely loves it. Thanks for sharing your thoughts! I haven't had a chance to try this out. Nice packaging. Got the lotion an I love it! Umm, no lo conozco, habrá que probarlo. Excellent fragrance, nice bottle. Hello dear stay in touch. I ve never tried this fragrance but i m very curios about it! I want try this perfume! Love the bottle I bet is smell great. totally agree with the review on this! I love the bottle! I follow you on twitter and facebook. Keep in touch! I've been curious about Fame for a while! The bottle looks like some sort of poisonous concoction. Something straight from a fairy tale. Thanks for the great review! I've seen this perfume, but I haven't tried it. Now, I'm intrigued! Love the bottle, I'm not really into celebrity perfumes! ohh, i want to try it! :) What if we follow each other? Let me know, sweetie! I want to try this perfume! Beautiful packaging! I have never smelled this perfume but it's very excited to get one of my own. Hi June, I didn't know this perfume before and honestly I never tried a perfume form a promi :) Thanks for sharing your experience! I haven't smelled it yet, but I'm going to check it out now ;) Not a fan of celebrity perfumes either usually, the majority of them seem tacky from the get go. The packaging does look amazing. I love this perfume! Dear June, I'm very fascinated by your description of the perfume, since the pyramid here doesn't exit. Moreover, one the the leading notes is belladonna... (wow!). As you, I often go to Fragrantica to read the reviews. A very INTRIGUING post! I am glad you like it but i don't think i would ever try it. The shape of the bottle creeps me out. I would pass on this one.